The racing week will begin this afternoon at Gulfstream Park and at Tampa Bay Downs, with conditions listed as fast and firm at both tracks. Gulfstream has an 11-race card with first post at 12:35 p.m. There will be considerable national attention because of a carryover of $4,003,307 in the Rainbow 6 on the last six races. 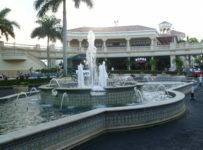 Gulfstream will have its regular Wednesday through Sunday schedule with first post at 12:35 p.m. each day. This week’s only stakes races in Florida will be on Saturday at Gulfstream. The $75,000 Cutler Bay is one mile on turf for males 3-YOs and up. 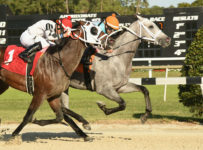 The $75,000 Sanibel Island is one mile on turf for 3-YO fillies. Tampa Bay Downs has ten races today, with first post at 12:25 p.m. Four races are scheduled for turf. According to the Weather Channel, there is a zero percent chance of rain in and around Oldsmar where the track is located. 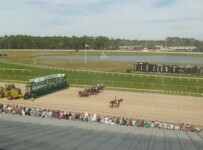 Tampa Bay Downs also will have racing this Friday and Saturday with first posts of 12:25 p.m. But it will not have racing this Sunday March 27, which is Easter Sunday. The Rainbow 6 is on races six to 11, with the sequence scheduled to start at 3:05 p.m.
Six races, including four in the Rainbow 6, are scheduled for the turf which is listed as firm. According to the Weather Channel, there is just a 20 percent chance of rain this afternoon in and around Hallandale Beach where Gulfstream is located. On our blog this afternoon, we will have a preview of the Rainbow 6 and will monitor it. The carryover is second largest in Rainbow 6 history, trailing one that reached almost $6.4 million in May 2014. It keeps growing because Sunday was the 49th straight day without the jackpot-hitting requirement of just one ticket with the winners of all six Rainbow 6 races. Today, Thursday and Friday will be the final three race days before Saturday’s mandatory payout of the day’s pool and full carryover–no matter the number of winning tickets.